All around us, there are cyborgs. Don't believe me? Go walk around any city grocery store and you will see people talking, apparently to no one, with blinking devices wedged in their ears. We're done wiring the world and now we're wiring ourselves, and I say if you can't beat ‘em, join ‘em. Motocomm's DSR-1003G (if that doesn't sound like a designation given to a cyborg part then I don't know what does) provides video and audio recording as well as mp3 player capabilities. Listen to your music through the included Thumper 1 helmet speakers as you create permanent evidence of your ride. Now, I'm probably just not being a visionary here, but I don't see what an audio recording would offer for a helmet-mounted camera besides lots of wind whooshing sounds. I suppose you might be able to used the sound as diagnostics for engine knocks, but who knows. Get creative. Digital is wonderful stuff. You might have hours of worthless footage that you can just delete while saving those 5 minutes of terror, beauty, awe, or whatever. The bullet-style camera is waterproof, and a universal mount that attaches to your bike or helmet is included. You can mount this on the tail of the bike or the side of your head, depending on the shot you want. A 1 GB memory is included, and the DSR-1003G has the capability to house a 4 GB SD card. 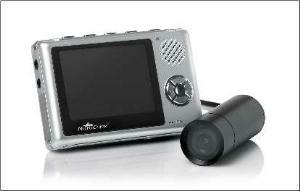 The camera shoots 30 frames per second at 320 x 240 resolution that you can watch with the RCA vidio/audio TV playback or download with USB connectors. Great if you want to survey road conditions or just play around. The latter is more likely. Cables and whatnot are included, and all for under $400.